« Those Oh So Sensitive BBC Editors….. 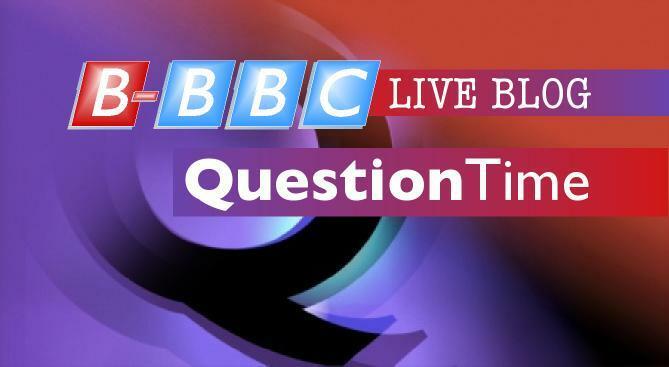 Question Time comes tonight from Birmingham; a post apocalyptic prison-city which was extensively remodelled in the mid 20th Century by Adolf Hitler and is located in a huge bomb crater somewhere in the Midlands. Highlights include nightmarish buildings, utterly miserable public transport and sadistic traffic systems. For this reason Birmingham has been designated an IKEA World Heritage Site. Birmingham currently holds the world record for fruitless scratch card scratching and bitterly screwed up lottery tickets. On the panel tonight we have Secretary of State for Transport Philip Hammond MP, Shadow Business Secretary John Denham MP, General Secretary of the National Union of Teachers Christine Blower, Labour supporting Sir Richard Lambert (although recently in favour of deficit reduction) and Polly Toynbee. LiveBlog commenters are kindly asked to leave sharp objects at the door. Your moderators accept no responsibility for injury or damage to nearby objects. Alcohol is virtually essential. The LiveBlog will also stay open for the bizarreness of This Week with Andrew Neil, and Michael Portillo. They are joined on the Sofa of Mediocrity by Gisela Stuart MP; hindered by some people calling themselves “Michael Rosen” and “Trevor Beresford Romeo OBE” who all of you down wiv da kidz peeps will know as “DJ Jazzie B“. Plus a political round-up from Adam Boulton. Joy. 4 far left Marxists and 1 Conservative In Name Only. That’s a balanced panel. The Bore makes it 5 ! It is to allow Brummies to make a high speed escape. How can the BBC, week after week, really justify the bias on QT panels ? 1 wet Tory, 5 Leftists , including Dimblebore. ( Is he not on strike today to complain about his pension ? ). And more to the point, why do the Tory wimpos put up with it ? Are they masochists ? Sadly, there just aren’t many true Tories left. Even John Redwood is suspect. Birmingham has a good orchestra, anyway. I don’t think I have enough alcohol on hand to deal with this week’s installment, though. Don’t they sell Irn Bru in New York ? No, Grant, we just have a few varieties of 40 oz. bottles of malt liquor. A couple of them have poetic names like St. Ides and Olde English. I always wondered where the English sold these brands, now I know. Went to Birmingham once. had a great balti and bought some dope from some (black) street vendors. The only time I have done that. And it wasn’t for me. Prefer real ale myself. Oddly enough their pitch was about thirty feet from the entrance to a police station. I always had fond memories of the place. Real ale is probably getting harder and harder to find with all the pubs closing. The top-selling beers in Britain are Heiniken, Stella, and Budweiser. An indictment of 13 years of Labour rule. Never thought of it like that, but the long-standing dominance of Labour in Scotland might explain the popularity here of Tennents. A brew that looks, tastes and smells much the same going in as it does coming out. Hoping that Gisela Stuart remembers her independence-if she does we may yet be surprised, because I have found her to be as good as Labour allows! Toynbee, Blowhard?…urgh…waddling champers bottles avoiding the top peoples care home that is Womans Hour. To be fair though-In Our Time with Melvyn Bragg was fine-so why the hell does the BBC continue to “do politics” when they no longer have any mandate to do so?…not since Birt as far as I can see! -I’ll be watching Glenn Beck’s final show on ‘Fox News’ instead tonight (Sky channel 509, 10 pm). Ye gods. Doesn’t Toynbee have a home to go to? Yes, yes, I know she has at least three but I am starting to wonder if she has a specially adapted broom-cupboard at White City, such is her omnipresence at Beeb towers. Note to QT production staff: other (more lucid, intelligent and rational) left-wing commentators are available. In fact, Johann Hari might soon have a little more time on his hands. Silly. Tuscany season isn’t for another fortnight yet. Aged 16, I <<Ahem>> ‘became a man’ in Birmingham.I’ve never been back. Or wanted to. Ever. I wish I’d done the deed somewhere else. Even Billericay. Or Canvey. Or Leysdown. But Brum ? Damn my youthful hormones. Still, at least the (very) lucky girl wasn’t a Brummie. So I’ve that to salve my pride. Incidentally, the French have a phrase “Etre de Birmingham”, meaning to be bored to death. (This according to Bill Bryson, so if it’s not true go bag on the beardy Yank, not your humble servant here). Buggy…. Toynbee lives in a cupboard in BBC HQ !! Ooh! Look who’s on Any Questions tonight. Sir William of Bragg! Lord Bragg of Burton Bragstocke to give the Bard his true title! The Beeb loves its self educating wannabies who want the House of Lords whilst whistling “Remote Control” by the Clash at the same time. No sense of irony at all, these sages of the Entitlement! Bragg ticka all the boxes for “lifelong learning”…if he gave all his guitars to all those prisoners he serenades inside, then he could at least be the politician he was born to be. Presumably Bragg will be cycling up to the venue-not far, and far kinder to the environment. Or maybe a hovercraft floating on his own sense of self-satisfaction and self-righteousness at the very least! Oh God-he`s going to be at Tolpuddle again as well. THat should lose the unions a few members anyway! It is not funny. It wouldn’t surprise me in the least if the “coalition government” gave Barge a peerage. If you heard him garbling his prejudices and Socialist Worker slogans under the concerned but compassionate Dimbleby Minor on the show: I think that you`d find that we have nothing to fear. His Winter Palace down on the Dorset Coast is our future Peoples Palace. It will be providing assisted dying facilities for the Unions once Tolpuddle dies on its arse…Blears, Hain…what titan of the left can we be expecting this year…Laura Penney?…Strauss Kahn?..